A perfect example of Preppy Tees put to good use! 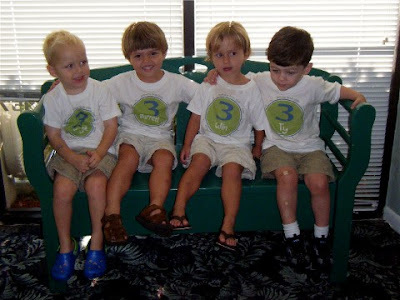 Four cute little dudes, celebrating a collective 3rd birthday! Each shirt has all of their names around the outside and a number 3 with their own name under it. These shirts were one of the moms special surprise to the other boys and I think you'll agree they are too cute for words! Enter the contest now and one of these Preppy Tees could be yours! See the previous post for instructions! You have til October 31st!